Never ending red and pink, love it! I especially love all the mug rugs! Check out these free tutorials, printables and patterns! Ohhh my! I love them all! 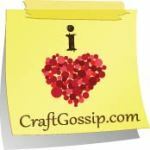 I have a few crafty ideas from all this inspiration!